The White Swan Public House in South Lake Union is equal parts pub and seafood shack — one that serves a mean currywurst. How can it be that after two decades of writing about food I’ve never eaten currywurst? Beats me. But now that I’ve had chef Josh Nebe’s take on this German street-food favorite at The White Swan Public House, I’m obsessed with currywurst. I’m a little infatuated with the whole restaurant, truth be told. 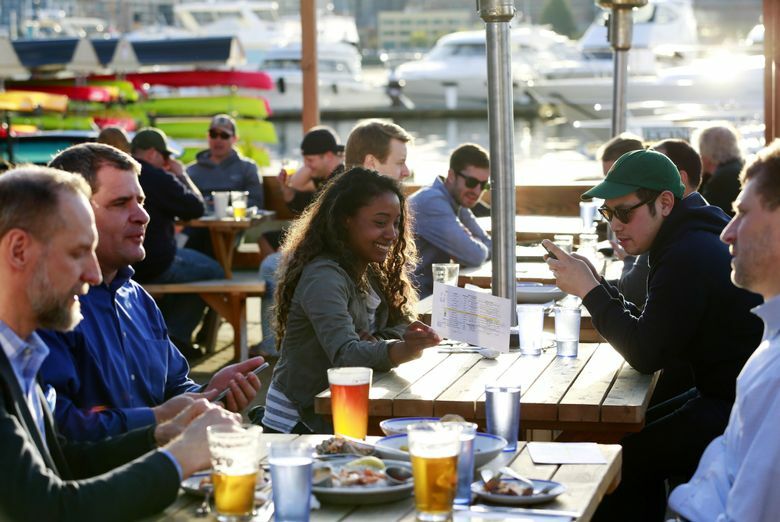 The White Swan, a dockside pub on the southern shore of Lake Union, is a seafood-leaning sibling to Matt’s in the Market and Radiator Whiskey. Like those side-by-side Pike Place Market restaurants, it syncs great food and drink with a unique atmosphere, in this case a weathered boathouse whose wraparound windows frame neighboring yachts and the distant Space Needle soaring above them. Until The White Swan opened last October, the 30-year-old Nebe was cooking alongside chefs Tyler Palagi and Charlie Garrison at Radiator Whiskey. “We have been molding him into this position,” says Dan Bugge, a co-owner of all three restaurants. Nebe’s father was born in Germany, his mother was raised there, and the family spoke German at home, hence his affinity for the cuisine of Deutschland. It’s the food he grew up eating on Vashon Island. At Radiator Whiskey, Nebe developed a talent for charcuterie. For the currywurst, he makes his own bratwurst, setting those sublimely porky, loosely packed links in cashew-sweetened curry-spiced ketchup. He adds fire-blackened cauliflower sparked with pickled sultanas, and piles frizzled potato threads atop the whole shebang. The dish has élan, but is solid enough to satisfy a stevedore. His pork belly rillons are another fixation of mine. Cured with hot-dog spices, the meat is confitted in pork fat, then deep-fried, resulting in crisp nuggets with melty middles. Topped like a fancy-pants ballpark frank, with pickled shallots, dill-flecked slaw and mustard-sharp Carolina Gold sauce, the dish is a grand-slam home run. Battered and fried maitake mushrooms score big, too. They are topped with fresh tarragon, chervil and a rose-tinted hard-cooked egg, pickled in beet juice. Even after you drag them through sauce gribiche (sort of an elegant tartar sauce), they deliver a satisfying crunch. The White Swan is equal parts pub and seafood shack, and nothing encapsulates that better than Poutine o’ the Sea, made not with gravy but with a peppery chowder reduction blanketing the sturdy fries. It’s loaded with bacon, chopped scallions and tiny steamed clams still in their shells. The guy next to me made a meal of it. 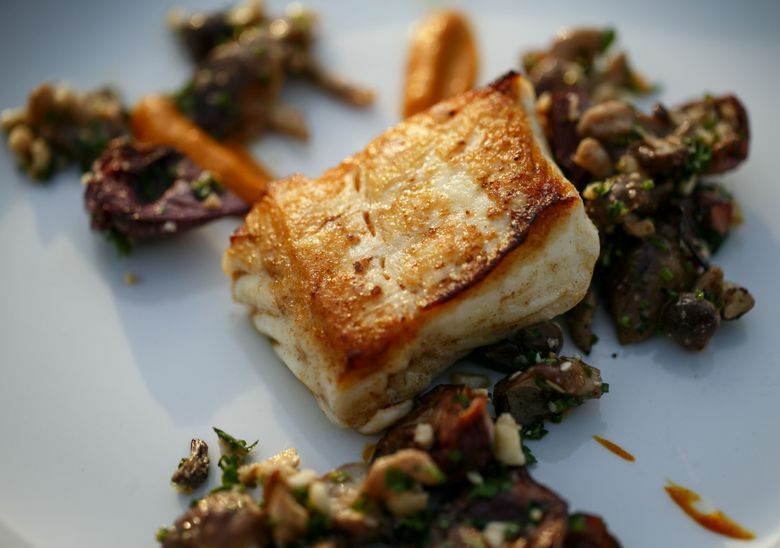 The woman with him had what I was having: first-of-the-season halibut sporting a pan-seared golden crust. Other hopeful signs of spring gathered around the fish: wine-braised baby artichokes, tiny pickled shiitakes and sunny yellow streaks of ginger-stoked aji amarillo sauce. A lot of the seafood here is local, like the oil-poached albacore that joins black-eyed peas, raw and braised celery, and pickled raisins in a robust salad roused with sherry vinaigrette. Oysters on the half shell all hail from West Coast waters right now. A couple of the six or eight varieties are discounted during happy hour. Knock them back with a local lager, a glass of Cremant or a slug of 12-year-old Bowmore scotch. Can’t make up your mind? Get a flight of all three for $13. Scallops come from the Japanese island of Hokkaido. They are seared on one side only, leaving them nearly raw. Roasted and puréed carrots play to their creamy sweetness, while notes of chili, mint, lime, and the salty crunch of breadcrumbs and bonito flakes, deliver an effective counter punch. Desserts are simple and homey. Every Thursday, sous chef Kayla Cramer makes pie. The thin, sugared crust seems almost too delicate to contain the fruit — layers of apple and huckleberries on my visit. If you miss out, her lemon custard tart is good, too. The house-made vanilla ice cream achieves perhaps its noblest calling in a root- beer float, poured tableside with almost as much ceremony as they assemble Spanish coffee at Canlis. There are, of course, more sophisticated libations. This is the sort of bar where, if the bartender senses indecision, he’ll offer to mix you a drink tailored to your tastes, whether that’s fruity, smoky, herbaceous or “clean.” Go for it. The liquor stash, displayed on thick shelves built of plumbing pipes and old wood, includes the French liqueur China China and Becherovka, the herbal Czech bitters. They use the latter in a bourbon-based hot toddy called “Jump in the Fire” served with a fragrant star anise pod floating on top. The White Swan is gearing up for its first full summer. Beginning May 1, lunch will be available from The 100 Pound Clam, an adjacent walk-up window on the deck. 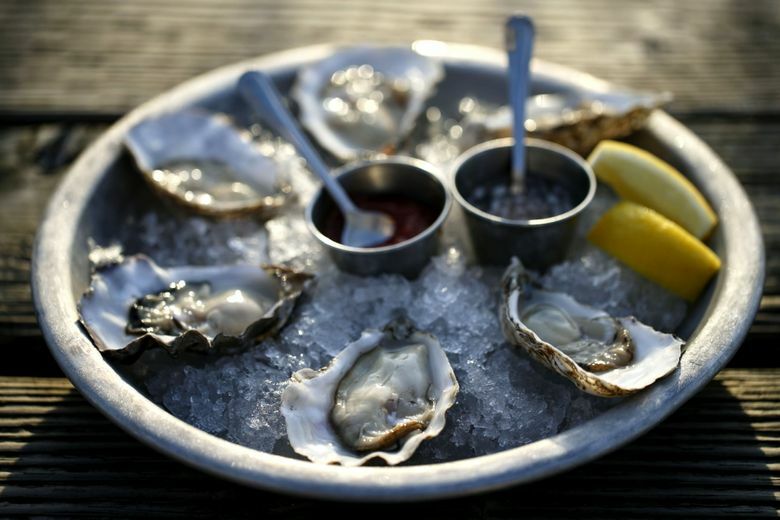 You can get chowder, oysters, fish and chips, peel-and-eat shrimp, sandwiches and more. The same menu is available inside The White Swan with full service. The deck more than doubles The White Swan’s capacity. There’s no doubt it will be a popular summer destination. But when the sky turns pewter and Mother Nature weeps, the cozy, low-raftered pub with its timeworn interior is a comfortable place to wait out a squall. There’s an intimate corner bar, a chef’s counter opposite a blazing oven, and bench seating at tables under a row of windows. Also, there’s currywurst.